In my current 18 years, I have had elections that have come down to one vote. One vote! So, it does matter says Stephanie McMillen, Grand Rapids Interim City Clerk. Applicants need to be registered voters of Michigan but cannot be candidates nor convicted of a felony. In early April at the Herkimer Community Room, Dwelling Place residents played a very interesting game of bingo. 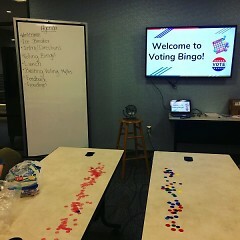 Voting Bingo is not played with letters and it’s not played with numbers. However, the competition was just as intense. It’s most accurately described as a combination of traditional bingo and jeopardy with questions relating to civics and government. This activity was part of Dwelling Place’s early initiative to increase civic engagement among their residents and to strengthen the political relationship between them and their community. After Voting Bingo, residents were asked questions about how Dwelling Place can increase residents’ accessibility to voting areas and how residents are already civically involved. Not surprisingly, most of Dwelling Place’s residents are already registered to vote. Specifically, out of 1,279 residents, 764 residents are active voters. One of the biggest concerns coming from residents, especially concerning this past presidential election, was the lack of excitement for candidates on the ticket. That’s what Victoria Kool experienced when she decided not to vote in the 2016 Presidential Election. Victoria is a current resident at Herkimer Apartments who has recently felt conflicted about her political views. Her conservative social views mixed with her dependence on government assistance has her questioning her political ideology for the first time. Justifying her lack of attendance in 2016, Victoria said that she, “couldn’t vote for either one of the major candidates,”. When asked how she would approach this common concern, McMillen responded: “If you either don’t like the candidates or don’t feel like you know enough about them to feel like you should select someone that you’re not very well informed about, that’s totally a personal option. You can not participate in that particular race if you want but still participate voting for proposals, voting for county clerk, whatever is on your ballot.” She emphasized that voting is a very personal expressional of political engagement however no one should feel obligated to vote for a person that they don’t believe in. Another issue that many residents encounter in the Heartside Neighborhood, is the lack of voice that they have within Grand Rapids politics. Victoria recounted the time of her life when she was homeless and not politically active: “When I was homeless, I was invisible. I was invisible and I was an annoyance. That’s all I was. You could go nowhere, you could do nothing. If you’re carrying a suitcase around downtown Grand Rapids, you are pariah." She even described the struggles of lower-income voters because they change addresses so often that it’s difficult to keep a current voter registration card. In Victoria’s experience, lack of information is the biggest obstacle to voting. Aside from being a tedious activity, Victoria says that people feel like they are a “danger to society” when they are voting uninformed. McMillen has operated as either a deputy clerk or city clerk for the past 18 years and the one topic she emphasizes more than anything concerning civic engagement is education. She admits that this isn’t the sexiest way to bring voters to the polls but believes that people young and old are starting to see how their voices matter: Voting, she concludes, has the potential to entice citizens because it’s the time they get to use their voice to better their government. Dwelling Place’s commitment to civic engagement goes beyond Voting Bingo: through the research of Learning Lab Intern, Bridget Silha, many resources have been created to help residents get involved including their polling locations, clerk contacts, and helpful voting documents. 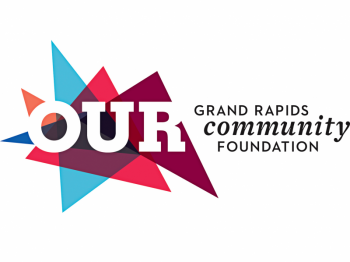 As Dwelling Place, the Heartside Community, and Downtown Grand Rapids comes closer to the 2018 Midterm Elections, there are many ways in which citizens can actively participate. One of the most popular and in-demand opportunities for residents is to work during the 2018 elections. Clerk McMillen highlights that this election in particular will need more staff members than previous years.